Click to go to deviantArt page with a higher resolution image. 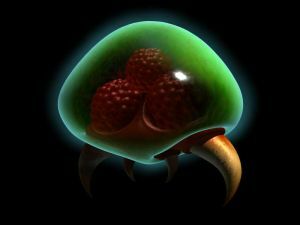 I decided to spend a few hours over the course of a couple of weeks to create this Metroid. He’s a fairly simple design with procedural textures. This was made in anticipation for Metroid Prime 3. Oddly enough, though, we’ve had the game for a couple of weeks already and I still haven’t played it any. :eek: I need to get around to doing that.